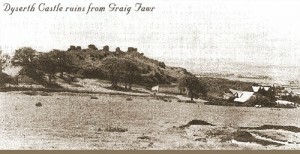 Before Henry III built his castle on Graig Back (Castle Quarry) in the thirteenth century as a defence against the Welsh, an earlier building is believed to have stood on Graig Fawr, where the struggle between Welsh and Saxon had ravaged the countryside. Only the site (on Graig Bach, small eminence between Graig Fawr and Dyserth village) remains of the old fortress, where much fighting was seen. 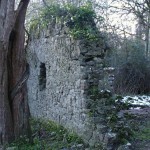 Shattered fragments of walls ranged round an inner bailey existed up to about 1900. Excavation only 2ft. 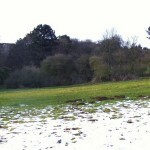 down has brought to light remains of four periods – Neolithic, Bronze, Romano-British and Medieval – suggesting that the hill was fortified during all these periods. 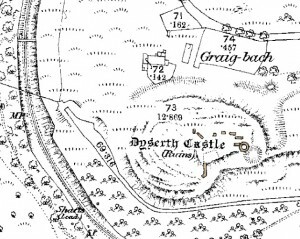 There are literary and traditional references to a “Castell Dincolyn” here in pre-Norman times. Henry III held Dincolyn in 1238, and re-built it in 1241. It was taken and re-taken, and was finally destroyed by Llywelyn ap Gruffydd in 1263 after a fierce resistance lasting five weeks. 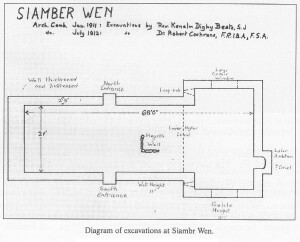 Excavations made by Mr. Leonard Hughes, R.C.A., showed the fortress to have been a very fine one, with outer entrenchment’s of stone and a drawbridge. Only a stretch of rock-cut ditch survives on a quarried site north of Dyserth village. Its small ward was entered through a twin-towered gatehouse and there may have been a concentric outer curtain – if so, the first in Wales. This ancient castle , now nearly in ruins, was probably a fortress originally built by the ancient Britons, before the invasion of their country by Edward the First, as the foundations cannot be traced. It has gone by the names of Din-colyn, Castell-y-Ffailon, and Castell Cerri, and was probably the last of the chain of British posts on the Clwydian hills. Henry the Third, in 1241, fortified it; but its date was very short, for in 1261, Llewelyn ap Gruffydd rased both this castle and that of Deganwy. It was at a siege of this place, that Einion, the son of Ririd Flaidd, was slain. A cross was erected on the spot, called Croes Einion, the shaft of which, ornamented with strange sculpture, is now supposed to form a stile into the churchyard at Dyserth, in which is another cross of curious workmanship. 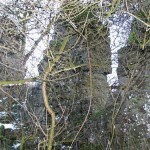 The castle occupied the summit of the rock, whose sides are escarpe, or cut steep, to render the access more difficult. 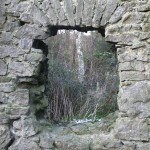 One part, beneath the top, is a square outwork, with fosses cut in part through the solid limestone. 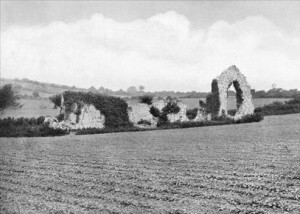 The fragments of the castle shew that its ruin was not effected by time; they lie in vast masses, overthrown by mining, which was a common method of besieging, very long before the use of gunpowder. HOC SI PETATUR LAPSIS ISTE CAUSA NOTATUR | EINION OXI RIRID VLAIDD FILIUS HOC MEMORATUR. Rough translation: THAT NEAR THE CAUSE OF THIS SECRET WRITING IF THEY ASK THE FALL | REMEMBER EINION THIS IS THE SON OF RIRID VLAIDD. 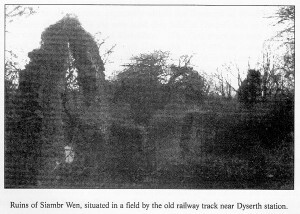 Siamber Wen– In a field near the Castle is a ruinous building, called Siamber Wen. 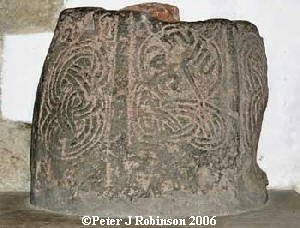 This is said to have been the seat of Sir Robt. Pounderling, once constable of the adjacent castle, a knight valiant and prudent, who had one of his eyes knocked out by a gentleman of Wales, in the rough sport of tournament; but being requested to challenge him again to feate of arms, on meeting the Welsh gentleman at the English court, declined the combat, declaring that he did not intend the man should beat out his other eye!